Which priorities, double-strategies and actions do we need in our globalized world to promote peace and stability? Let us start with a simple metaphor. Think of yourself as a plumber, with a tool-box full of hammers, screwdrivers and twenty other tools. As a good craftsman, you would look first at what you have to repair and then choose the tool which serves you best. Job done: quick, easy, and effective. Not so in foreign affairs. We have to address this weakness and change it. Foreign policy 'hot spots' are looked after by several craftsmen at once: politicians in parliaments where parties have different views; the media; public opinion; the foreign office; the defense ministry; generals; the UN, and all these actors from other countries too. In the end, several dozen people with strong egos and their own perceptions. If it sounds like chaos - it is. Finally, action comes too late, is usually uncoordinated, and costs tax payers a lot of money too. This has been the bad experience of Iraq and Afghanistan. A crucial foundation of foreign policy is to analyze all options carefully, and draft a strategy paper that includes all these options alongside all differing opinions at home and abroad. Do not push decision makers in one direction from the beginning. Longer option and opinion papers are needed. Options need price tags. You need to know the costs of actions or inaction as precisely as possible. But in foreign affairs, vagueness prevails. Wars end up costing hundreds of billions of dollars or Euros. What our craftsman would do is almost unheard of: avoid using a very expensive army when you can achieve the same result more cheaply with different tools. Get away from the mania and mantra of huge international peace conferences, state visits and UN debates. Come down to earth and ask what the local population wants, needs, thinks. Peacemaking cannot succeed using only the perception from 10 Downing Street No 10, the Kanzleramt, or the White House. Too often we find ourselves in a Western perception trap. Only after you know the facts, options, opinions, the costs involved, and the local needs and wishes - can you then start to write a double strategy paper including both soft and hard factors of peacemaking. Only after that can you choose the best, most efficient and least expense option for action. Always develop a double strategy containing two equally important pillars of hard and soft power. Power goes with reconciliation as hawk goes with dove. More than ever, we need a smart power policy for each problem area in the world. Let us as not be naïve though: we need both hard and soft factors. As Carl von Clausewitz tried to teach in his famous book "On War", all war is politics and therefore this soft factor prevails over weapons. Weapons are in the end simply tools of politics. We have to teach that soft does not mean weak, and hard does not mean strong. Soft can be strong and hard can ultimately be weak. Each point in the action plan needs a realistic short and long term time horizon. An administration must check the efficiency of actions taken every six months, using a check list like any craftsman or entrepreneur would do in the business world. In our open and democratic societies we have to make public what we want to reach, when, and how. Nothing can be hidden. Each government should produce an annual detailed report for their parliaments about important foreign affairs hot spots like Afghanistan, Iraq or Iran. Democracies are strong when they debate openly and weak when everything is covered up and not carefully discussed in parliaments and in public. Politicians tend to fill the vacuum of their know-how with buzz words and headlines to avoid digging deeper. So do the media. A war of superficialities prevails. We cannot change this, but we need to enrich it with the substance of action options and that described in rules one to eight. Otherwise we will remain stuck in nonsense debates and poorly thought-through plans. This would eventually mean many dead soldiers and civilians on the ground, billions wasted and no real peace at all. "I am calling for an elite which takes over the promotion of tolerance and respect as a common soul of our global village now, and does not just wait for politics. I am calling to impeach the radicals by taking over as an elite the responsibility for a better world of moral values. The world is now multi-polar and relative Western power is declining. We should push new powers to take on their own peace missions and not dominate regional conflicts with power projection from Washington alone. Let's start this fresh approach together- now!" Capitalist democracies know best how to promote Coca Cola, BMW or McDonalds. But do we know how to promote our Western values in foreign affairs? Our democracies do have many flaws and weaknesses. Why not use exactly what we can do best: our boundless creativity and promotion power? Therefore we should have a 'creativity focus' for any hot spot in the world, collecting all best pratices and ideas from NGOs, private citizens. We should start a fresh new foreign policy under Albert Einstein's very important advice: "Imagination is more important than knowledge". We also need clear priorities of how and what we convince the public best. Needed here is a real double strategy of power and reconciliation, hawk and dove, Uzi and olive branch, for peace making. There is nothing like that in Washington DC or in Tel Aviv or the EU yet. The focus on 'land for peace' is too narrow, like the bunker mentality of Israel. We should not only think and debate sanctions against Iran but also support the 'green' movement with much more cash and hundreds of millions of Euro and Dollars. We can also start a debate about the moral and immoral deeds of the Mullah dictators and the Revolutionary Guards. We must integrate, using tailored double strategies, the large emerging powers, and not simply perceive them automatically as trouble makers. Until now we have been lacking a clear, smart double strategy in homeland security and addressing terrorists who argue they defend Islam. Presently police and intelligence approaches dominate. First, we have to make much clearer that al Qaeda and other terrorists are just criminals, and have nothing to do with the true teachings of Islam. That they break all rules of Jihad, which never allows killing of civilians who do not attack you directly. That whoever argues like them is insulting the Prophet himself and Islam and should be excluded from the Ummah. Second, we all have to promote the Human Codes of Tolerance and Respect, to support the positive forces in the world and respect towards other religions, races and ethnic minorities. If we do not actively fight, negative forces will dominate the debate and actions as well. (see www.codesoftolerance.com). "Until now we have been lacking a clear, smart double strategy in homeland security and addressing terrorists who argue they defend Islam. Presently police and intelligence approaches dominate. First, we have to make much clearer that al Qaeda and other terrorists are just criminals, and have nothing to do with the true teachings of Islam. That they break all rules of Jihad, which never allows killing of civilians who do not attack you directly. That whoever argues like them is insulting the Prophet himself and Islam and should be excluded from the Ummah. Second, we all have to promote the Human Codes of Tolerance and Respect, to support the positive forces in the world and respect towards other religions, races and ethnic minorities." For the World Security Network, tolerance and respect are the lifeblood of peaceful coexistence and crucial elements of the "soft powers" of peacemaking. Unfortunately today we leave the most important questions of peace, reconciliation, tolerance and respect to a loud but tiny minority of radicals, a majority of mediocre politicians, and mainly backward-looking academics. Furthermore, we do not have an action plan like in business for their promotion. Does this work? - No. Will this work in the future? - Not at all! Only you - the global elite of this world - can do it! - but we remain for the most part silent and passive, and we only observe the negative actions of radical minorities on TV. We have a large pool of creativity and optimism. I am calling to impeach the radicals by taking over as an elite the responsibility for a better world of moral values. The world is now multi-polar and relative Western power is declining. We should push new powers to take on their own peace missions and not dominate regional conflicts with power projection from Washington alone. Let's start this fresh approach together- now! 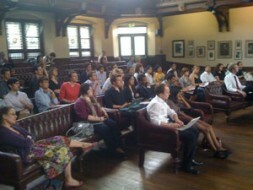 *Speech at the Conference on Hard Vs. Soft Power at the International Forum on Foreign Policy Strategies in Contemporary International Relations in the Cambridge Union, Cambridge, 26th June 2010, organized by the Institute for Cultural Diplomacy (ICD),an international, not-for-profit, non-governmental organization based in Berlin. 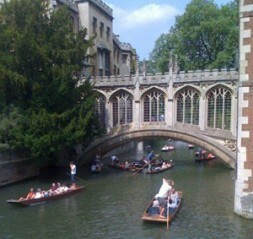 (www.culturaldiplomacy.org) and the Cambridge Union Society is Cambridge University's, the largest student society and the oldest student debating society in the world. (www.cus.org). See as well www.worldsecuritynetwork.com and www.codesoftolerance.com.